Mona Hatoum was born in Beirut to Palestinian family in 1952. She lives in London. Hatoum challenges the movements of surrealism and minimalism, making work which explores the conflicts and contradictions of our world. Her studies at the Slade School of Art coincided with developing ideas around gender and race, and she began to explore the relationship between politics and the individual through performance. In the late 1980s she began to make installations and sculptures in a wide range of materials. These often use the grid or geometric forms to reference to systems of control within society. She has made a number of works using household objects which are scaled up or changed to make them familiar but uncanny. What is her cultural background? The title Hot Spot 2013 refers to the term ‘hot spot’ meaning a place of military or civil unrest. 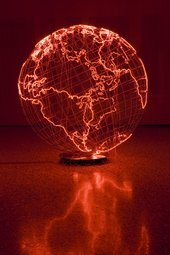 Using delicate red neon to outline the contours of the continents, this sculpture presents the entire globe as a danger zone – what Hatoum describes as a ‘world continually caught up in conflict and unrest’. Measures of Distance 1988 is a video constructed from images of Hatoum’s mother in the shower of the family home in Beirut. The Arabic writing overlaying these images like a curtain or veil represents her mother’s letters from Beirut to the artist in London. The soundtrack consists of an animated conversation between Hatoum and her mother overlaid with Hatoum’s voice reading a translation of the letters into English. For Hatoum, as much as the work portrays the emotional intimacy of the relationship between mother and daughter, ‘it also speaks of exile, displacement, disorientation and a tremendous sense of loss as a result of the separation caused by war. Grater Divide 2002 mimics a room divider, like those used in changing rooms or hospitals. You’ll quite quickly notice, however, that this object is a 6 ft cheese grater. The piece is both comical and sinister, strangely graceful as a sculptural piece. The holes in the kitchen utensil are relatively harmless, but scaled up to these proportions they become threatening and potentially harmful. 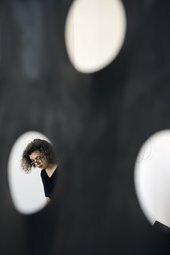 The power of Hatoum’s work is her ability to transcend local and personal issues and make them universal and it’s why she remains one of the most important artists in her generation. Hatoum is a latter-day surrealist, imbuing the familiar with darker, stranger meanings. I’ve always had quite a rebellious and contrary attitude. The more I feel I am being pushed into a mold, the more I feel like going in the opposite direction. My favourite way of working is to go and spend time in the place I am exhibiting in and make work locally. I feel much more inspired when I… can work with people and materials that I find in that location.